Jumping from one recipe to other recipe unable to decide which one to try for this season, finally I settled down with a small list and happy to be part of this festive buzz. 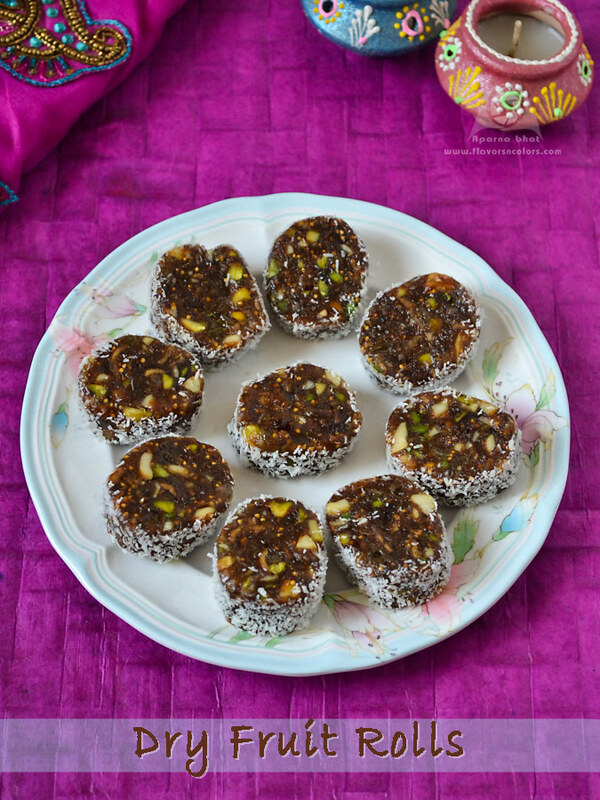 These days with trend of consuming sugar free / sugar less sweets, I thought to post recipe of simple sweet prepared from dates, figs and nuts. Dates and figs are both sweet naturally and act as best binders instead of sugar. You must have come across its recipe on various blogs trying to use either or both of these natural sweeteners along with nuts. The basic recipe remains the same and there are subtle variations with respect to additional ingredients used in different quantities as per their preference. 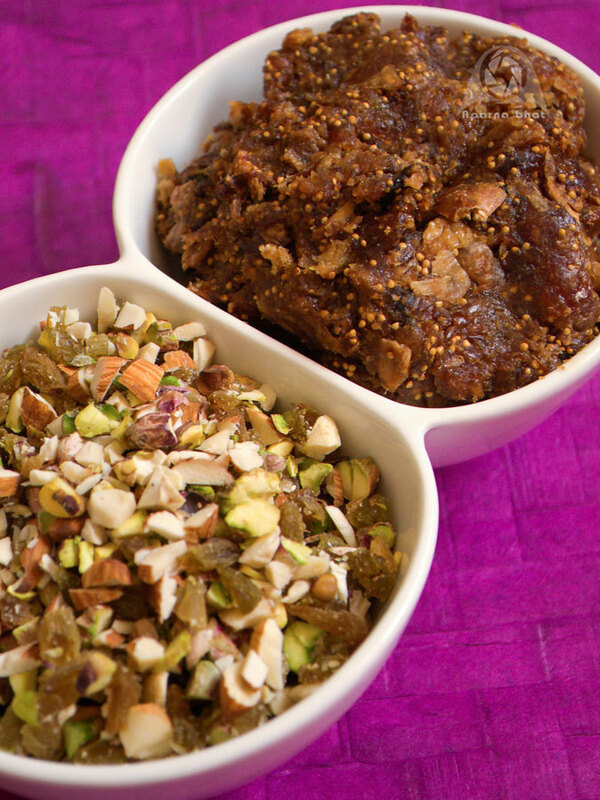 There is absolutely no preparation required except stocking the dryfruits. Here is how I prepared these rolls/ balls. 125 gms various nuts. I have used almonds, cashews, pista and raisins. Dry roast almonds, cashews, pistas separately in a pan on low flame. Keep them aside to cool it. When cool, place these roasted ingredients and raisins on chopping board and chop it roughly. You may use food processor to grind them coarsely but I preferred to chop them manually. Next you may chop the pitted dates and figs. I put them in food processor and processed it until it turned into a stick ball. Heat ghee in a nonstick pan. Transfer the sticky ball to this pan. I added 2 tbsp of water [that was used to clean the jar of food processor]. Cook it for 3-4 minutes until the mixture becomes mushy. Next add chopped nuts and mix it well. Remove from the flame and allow it to cool. Divide the portion into 3, place each on parchment paper and roll into cylindrical shape. Twist the ends of the parchment paper just like toffee wrappers. Transfer these logs to refrigerator and allow it to become firmer before slicing. After about 2 hours take them out and unwrap the paper. Slice them into discs of desired thickness. 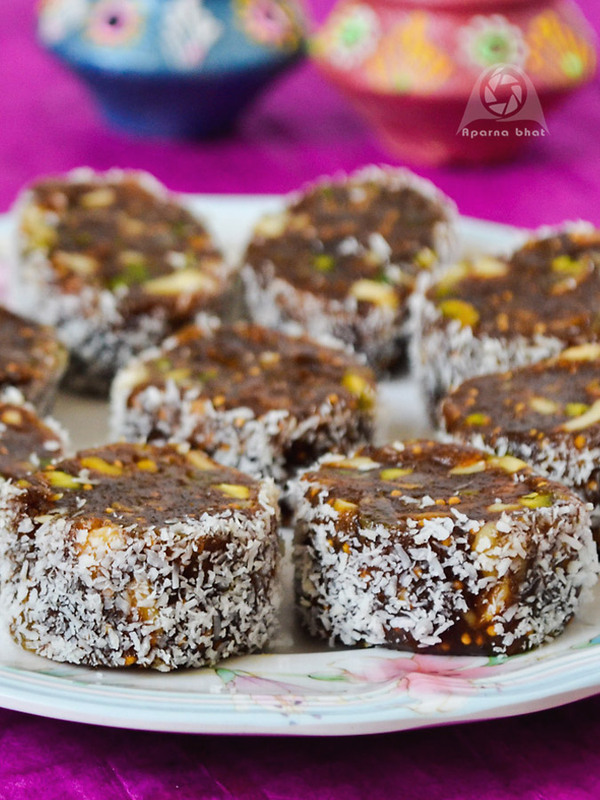 Roll each disc in the plate having desiccated coconut so that the side of the discs gets coated with it and will not stick when placed on serving plate. You may make it as energy bars/squares by setting the mixture onto a greased plate and later cutting into squares. Alternatively you can roll them into balls and coat with sprinkles to be served as Dryfruit truffles. Get, set go pop them into your mouth and enjoy this yummy treat. Remaining ones, store in airtight container and refrigerate them. You may prepare this by excluding figs or prepare it only from figs and no dates. You may enhance the flavor by adding cardamom powder/ nutmeg powder or vanilla essence. You may add dry roasted pumpkin, cantaloupe seeds to this sweet. 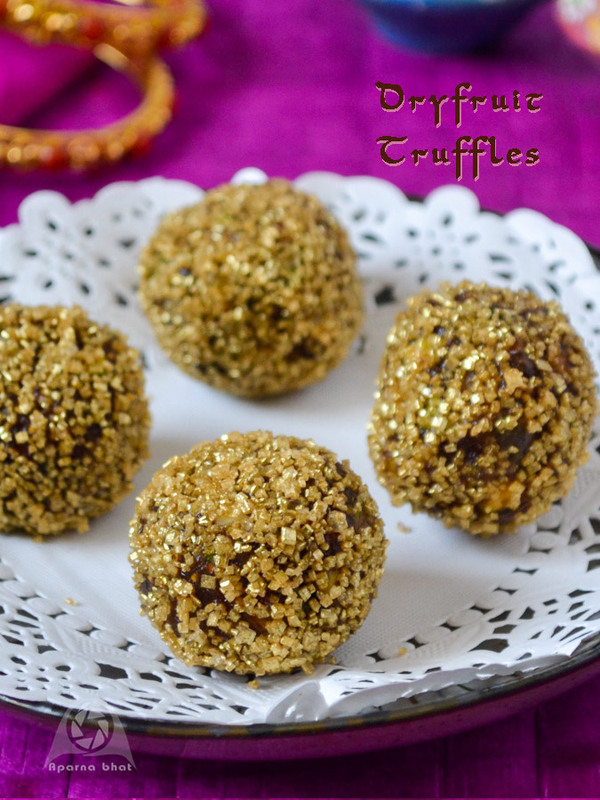 Today being Dhanteras, I used golden sugar sprinkles for the above truffles as a decoration to go with the theme of Dhanteras celebrations. You may skip them to keep it sugar free. Wishing my readers A Very Blessed and Happy Dhanteras ! May goddess Laxmi shower you with good health, happiness, prosperity and may your life be filled with all golden moments! really inspired the way you explained in pictorial manner. thank you for wonderful recipe blog.